← Law School for Legal Consumers? No one else is responsible for what happens to you but you, so you can either complain about the things you don’t like in your life or you can set about changing them. This advice also relates to legal consumers’ relationships with their attorneys. Legal consumers can use these same 7 habits to take control of their attorney/client relationship. Habit One: Be Proactive – Take responsibility for your relationship with your attorney. “[T]hough you can’t control the stimulus, you can control your response.” Much like training an animal or dealing with children, your words and attitude can guide the interaction. Habit Two: Begin with the End in Mind – Envision your legal goals so that you won’t be at risk of external circumstances derailing the end result. Begin every day with an updated vision of your goal and how to accomplish it. Habit Three: Put First Things First – Define why you are engaged in the legal matter at hand. It will allow you to determine what course to take and when to “just say no” to your attorney. Habit Four: Think Win-Win – Try not to think of the relationship with your attorney as adversarial, even if it has become that way. Express your ideas and questions with courage, and remain cognizant of your attorney’s viewpoint. Habit Five: Communication – Communicate effectively with your attorney by first listening to him/her and understand their point to find common ground. Habit Six: Synergize – Work with your attorney to find creative solutions to problems as they arise. Habit Seven: Sharpen the Saw – Take care of your physical, emotional, mental and spiritual self to develop the strength to undertake the preceding six habits. Legal matters can be physically, emotionally, mentally and spiritually draining, so be sure to fortify yourself. Follow these seven habits, and you’ll be on your way to becoming a [smart legal consumer]. 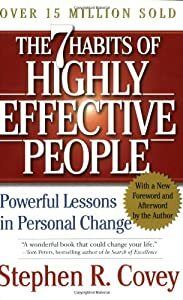 This entry was posted in Tips and tagged Advice, Attitude, Attorneys, Awareness, Books, Legal Consumer, Proactivity, Seven Habits of Highly Effective People, Stephen Covey. Bookmark the permalink.